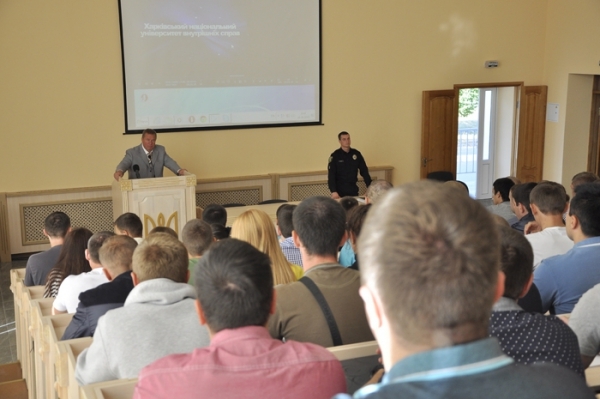 Kharkiv National University of Internal Affairs continues training specialists for the new patrol police of Kharkiv. On Monday, 281 trainees began initial training for the patrol police. Among them, 244 men and 37 women. Head of patrol police Eugene Melnyk congratulated them with the first day of training and wished perseverance and endurance. The participants watched a film about the university. Also the certificate awarding ceremony and the ceremony of taking the oath were performed dyring the event. Recall that on September 26th the new police took the oath at the Freedom Square.